Kagan Structures to Develop and Engage 15 Thinking Skills! 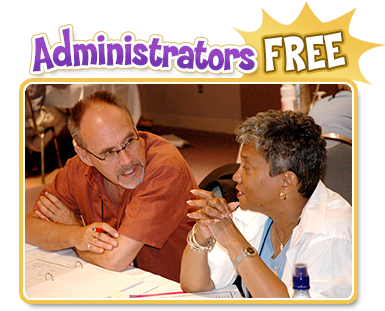 • All approved administrators attend FREE. • One FREE administrator with three paid participants. • Two FREE administrators with five or more paid participants. Exclusively for principals, vice principals, and approved district administrators. No substitutions. All participants and administrator(s) must be from the same school or district and must be registered together at the same time. E-mail completed registration form and a copy of your business card to registration@KaganOnline.com. Call 800.266.7576 for details. Click here to find another engaging Kagan event.